The recent series of terrorist attacks in France has forced Russia and the West to recognize the undeniable fact that there is a common enemy – international terrorism, represented first and foremost by ISIS. This enemy must be crushed with united efforts, while all other disagreements should be given secondary importance. After recognizing that a terrorist act was responsible for bringing down the Russian passenger airliner in Egypt, Russian President Vladimir Putin affirmed that "Russia's business in Syria is correct." Revenge for the deaths of the 224 passengers has now become a matter of national principle. "The murder of our people in Sinai is among the bloodiest crimes in terms of number of victims. This will remain with us forever. But it will not prevent us from finding and punishing the criminals," said Putin, citing Article 51 of the UN Charter on a country's right to self-defense. Russia has promised an unprecedented reward of $50 million for information leading to the capture or death of the terrorists responsible for the tragedy. Although Putin was careful in using the words "revenge," "chastise" and "punish" in reference to the terrorists, his press secretary Dmitry Peskov was more blunt, saying that the special services had received an order to "destroy" everyone involved in the terrorist act. That is, without a trial. Moreover, by citing Article 51 and by using a hard tone, Putin made Russians understand that the terrorists' "punishment" will be similar to the actions of the Israeli special services, which in their time hunted down the Palestinian terrorists who captured and murdered Israeli athletes during the 1972 Olympics in Munich and killed them without any judicial hassle. What consequences could Moscow's official recognition of the terrorist act have? It is unlikely that this will become a reason to immediately cut air communication with other countries (as was done with Egypt) that pose a significant terrorist threat. Several Russian parliamentarians have already voiced such thoughts. But in my opinion, this extreme measure will be implemented only in the case of a more dangerous escalation of terrorism. For now Russia’s federal air transport agency is recommending the level of air security be increased on flights to 47 countries, including some European countries and the U.S. Concerning Syria, the expected and already announced increase in the number of strikes on terrorist targets will not lead to a Russian ground operation in the country. A single anti-terrorist front will also not be formed, for now. Yet coordination between Moscow and the West after the terrorist acts in Paris and the G20 summit in Turkey, where the subject matter was discussed in a new context, will doubtless intensify. Relations between Russia and the West in light of the new recognized threat are obviously better today than they were a year ago. 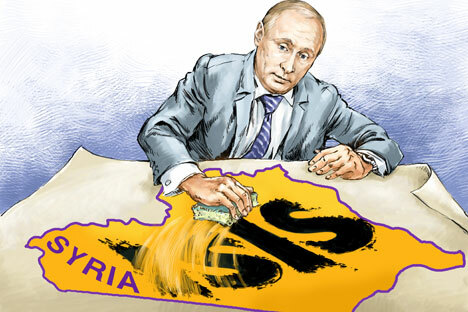 Moscow is therefore bound to increase the number of air strikes on ISIS positions but will refrain from striking forces belonging to the Free Syrian Army, which the West considers the "moderate opposition." However, the West has still not given Moscow the list of sites controlled by the so-called "moderate" opposition in order that Russia not bomb them. This, unfortunately, demonstrates the extremely low level of trust between the sides. However, closer coordination between the sides concerning those who certainly should be bombed has already begun. The fact that immediately after Putin's statement the Russian air force launched an attack on what is basically the Islamic State (ISIS) capital, Raqqa, is proof of this. With respect to the ground operation, even though experts believe that a full victory over ISIS will be impossible without it and neither the forces of Assad nor the Kurds are enough, the matter is much more complex. And more ominous. Islamic State, which gives significant importance to the early Islamic surahs (verses) in its propaganda and ideology, actually longs for a "decisive and final" ground battle with the "forces of Rome," that is, the West and the Christian world as a whole. The battle, according to such prophecies, must take place near the Syrian town of Dabiq (now controlled by ISIS), which is not far from Raqqa. If this interpretation of ISIS's intentions is true, then the Parisian terrorist act and the downing of the Russian plane are both provocations, "invitations to a battle" from the fanatics. If the invitation goes unanswered, there will be more "invitations." This confirms that the fanatics and obscurantists have posed a very serious challenge for our civilization. And for now our disagreements on things that are profoundly secondary are preventing us from forming an answer to the challenge. The author is a political analyst and member of the Council on Foreign and Defense Policy, an independent Moscow-based think tank.